The Northstar Lacrosse Camp is designed to teach and develop the fundamental skills of the game: throwing, catching, cradling, shooting, feeding, ground balls, offensive and defensive skills while focusing on improving participants level of confidence. Players will be divided by grade and skill level to ensure everyone is getting the appropriate instruction they deserve. 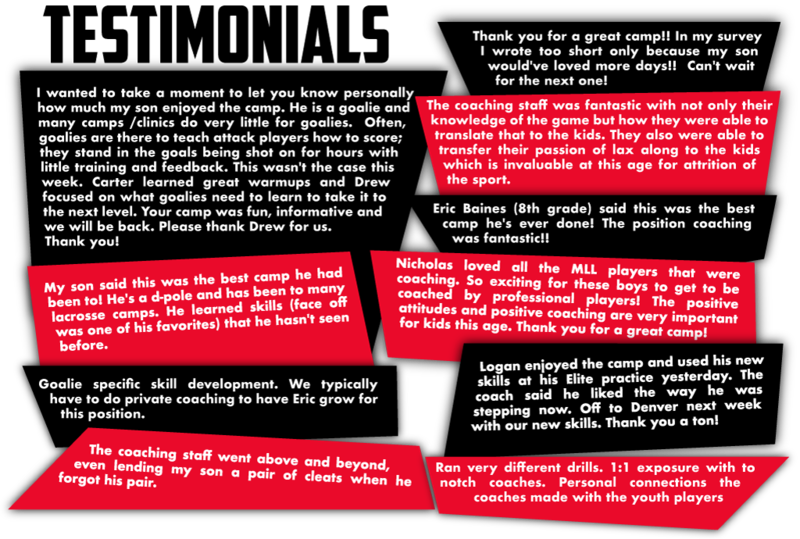 The camp will focus aggressively on positional training along with specific goalie training for goalies. Staff Experience: The staff at the Northstar Lacrosse Camp is handpicked for their ability to teach, motivate, and relate to the campers. Each coach is prepared and stacked with content on skills he will be teaching prior to the camp. We have coaches who even attended our camp 15 years ago giving back to players that were once in their shoes. That alone shows the appreciation for the game and the future of your player. 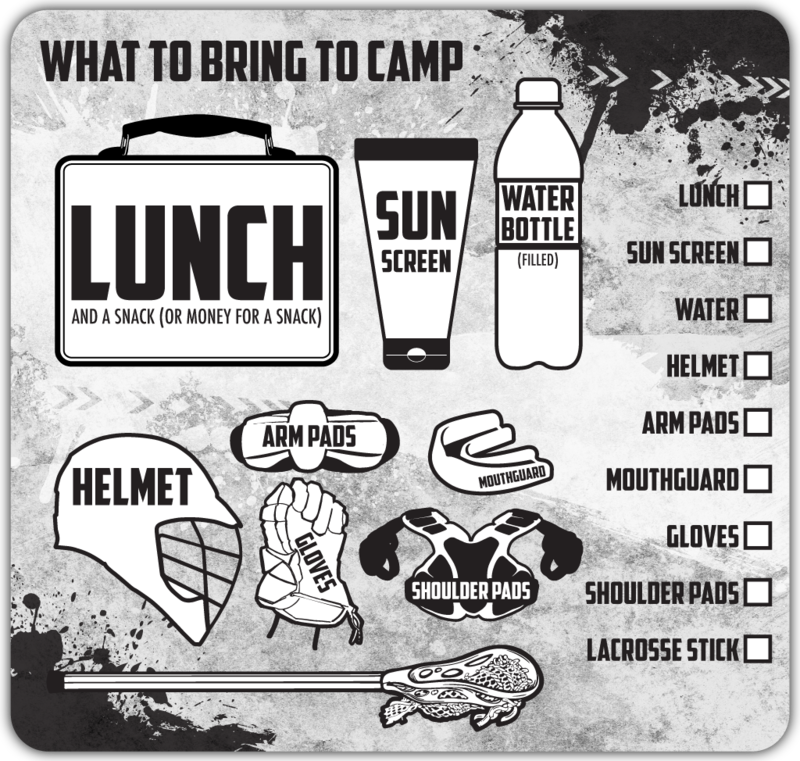 Parent Experience: For 15 years parents have known that Northstar Lacrosse Camp stands for safety, instruction, and tremendous organization. Northstar Lacrosse complies with all state safety guidelines and health department regulations, but our ultimate goal is to make your child a better lacrosse player. Camper Experience: Campers are guaranteed to have an absolute blast with their teams playing games, hanging out with friends and participating in tons of instructional drills. We also love to raffle off free gear! Do the research, ask someone who’s been there, and come see for yourself how great the Northstar Lacrosse Camp really is! We attract players from all over the midwest as well as Canada. This enables you to play against, and learn with people of many different backgrounds providing the opportunity to make life-long friends. There are hundreds of our former campers that have gone on to play NCAA Division I, II, III and club lacrosse at very high levels in college. We are the #1 teaching camp in Minnesota and the owner of the camp is on the field for every day of the camp to oversee everything! Over the past 15 years Northstar Lacrosse has established themselves as one of the most accomplished pioneers in Minnesota Lacrosse history, and has developed a curriculum that teaches lacrosse players of ALL positions and experience to take their game beyond the next level. 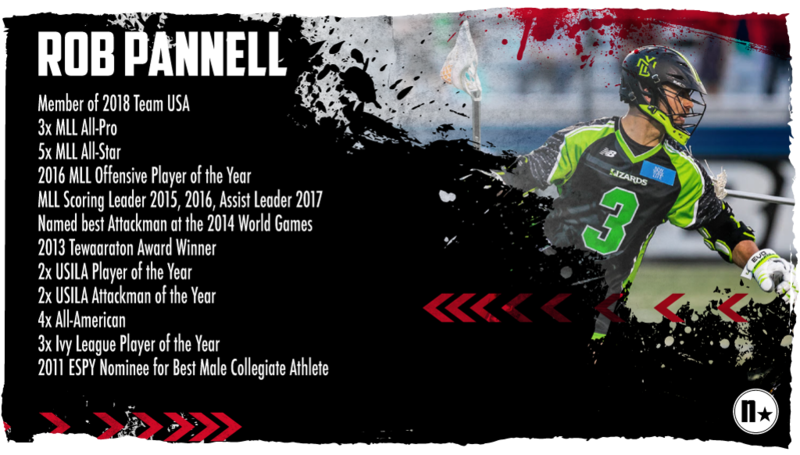 Rob Pannell, along with his hand-picked staff, oversees each teaching segment to ensure that your son is getting the best instruction available. This is not a camp where we just roll out the balls and play games. Our elite staff of professionals - Northstar Lacrosse employs full-time, year-round Directors who spend the entire off-season selecting our summer staff. Our coaching staff is selected not only on playing experience and accolades, but by their ability to teach the game to young athletes. Our camp offers dynamic teaching of basics to younger, less experienced players; and challenging, more complex skill sets to older, more experienced players. We taylor the instruction to each player's individual needs. Our creative teaching settings - All facets of the game are covered in our teachings. They involve large group lectures and small, intimate settings. Special goalkeeping and defense training - The Northstar Lacrosse Camp provides specific and detailed instruction for a new generation of goalkeepers and defensemen. If you play Goalie or defense you will not want to miss the opportunity of being taught by the best! We take safety and security very, very seriously. The camp is staffed with certified trainers, as well as either an EMT or nurse. Signing up your child for a youth sports season, camp, or tournament is a big deal. It requires a huge commitment of time, energy, and finances. Between the registration fee and associated travel costs, you could be out hundreds or even thousands of dollars if unforeseen circumstances prevent your child from participating. 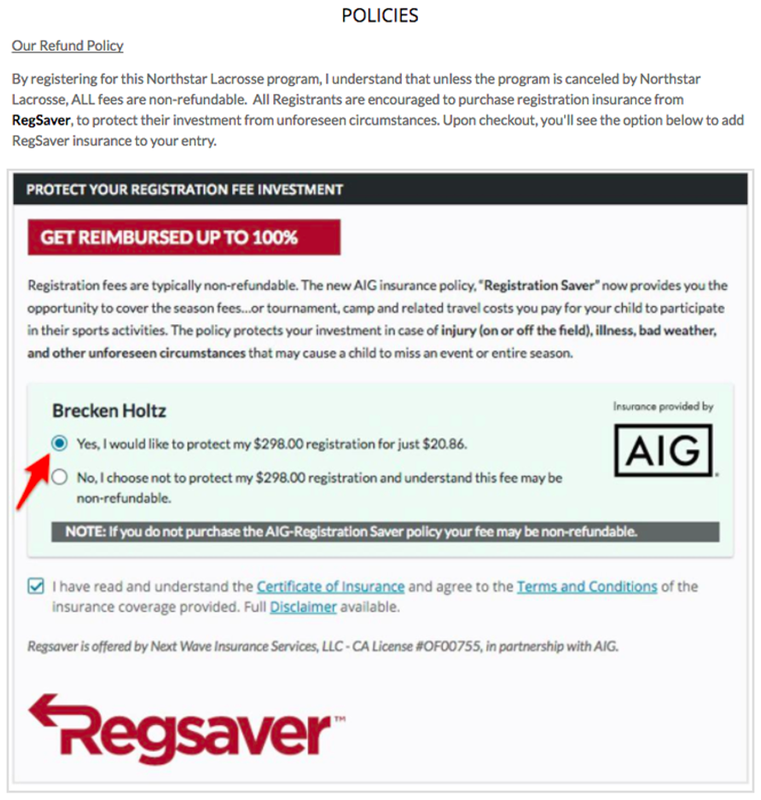 That’s why Next Wave Insurance is proud to offer a solution to the typical “no refund” policy associated with registration and sports-related travel. By purchasing an AIG backed policy you can safeguard your investment. Regsaver can give you the confidence you need to enjoy your child’s season as much as them.We hope you never need it, but if you do rest assured, Regsaver has you covered. Northstar Lacrosse Camps and clinics will aim to meet rain or shine but, in the rare instance of a thunderstorm and/or lightning during, or prior to, any outdoor lacrosse sessions, Northstar Lacrosse does reserve the right to cancel a camp or clinic session if the conditions are unsuitable and/or dangerous for reasonable lacrosse play. If the forecast on the day of a given session clearly calls for thunderstorms and/or lightning before the start of a camp or clinic session, programs might be canceled in advance of a camp or clinic session starting. Determinations whether to cancel any session(s) will be made at the discretion of the camp directors. There are no refunds or prorates for camp or clinic days that are canceled due to weather. If more than half of a camp or clinic program is canceled due to the weather, then a tuition refund will be issued to all registrants depending on the situation. If less than half of a program is canceled, then no refund will be issued. We would much rather be on the field coaching and learning but, unfortunately, the weather is out of our control and that has to be understood. It is customary that Northstar Lacrosse will issue coupon codes via email for future programs, on a case-by-case basis, should camp or clinic cancellations occur. 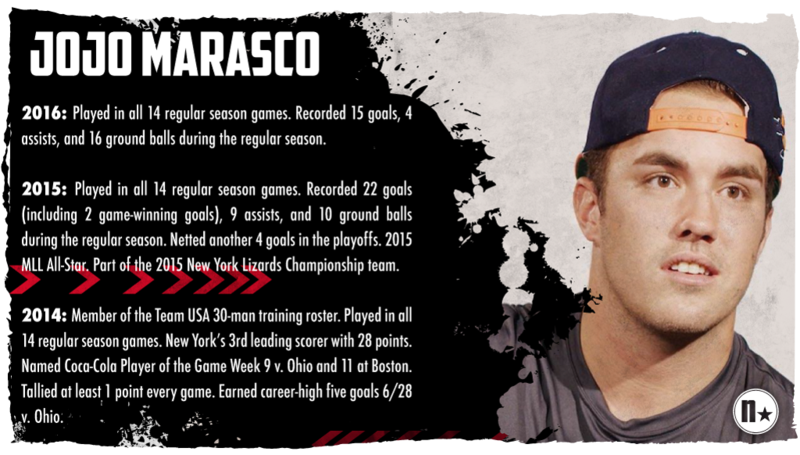 ©2019 Northstar Lacrosse Company / SportsEngine. All Rights Reserved.